A little secret to the high cost of eggs may finally surface. And it's not chicken feed. Lost in the media frenzy to blame corn prices for all of our economic woes, the chickens have come home to roost on the higher cost of animal rights. What does this mean? Egg producers will meet a stricter standard for caring for their chickens. 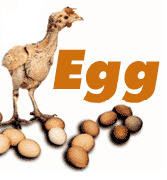 More room per chicken, less stress to produce less eggs and more costly audits means less eggs and higher costs per egg. Egg producers have been phasing in these new standards. And as worldwide demand for eggs has increased and the credit crunch has made borrowing money costlier, the egg producers have not invested the money to build newer facilities to raise the same number of birds. But you probably won't hear about this from the egg producers or the media. Why discuss this little secret when all of the blame can be laid at corn costs? A dozen eggs only requires about 4 pounds of corn, at maximum. And that's just pennies per egg in costs. Increased cage space per hen, which is being phased in to avoid market disruptions. Standards for non-feed withdrawal molting procedures based on the most current, verified scientific studies. Standards for trimming of chicks’ beaks, when necessary, to avoid pecking and cannibalism. Maintaining constant supply of fresh feed, water and air ventilation throughout the chicken house and monitoring for ammonia. Standards for daily inspection of each bird as well proper handling and transportation. PETA has had a similar campaign for a number of years for consumers to avoid eating eggs altogether and regularly pressures major egg buyers (for example, McDonalds) to meet higher requirements for egg and food production. Animal welfare is an important aspect of our food production. But remember that it comes at a cost.